I love it when we receive letters from campers telling us about their summer camp experience and thanking our staff for all they did during their visit to SpringHill. But, up until this week, we’ve never received a pre-camp letter written in anticipation of a child’s visit to camp. 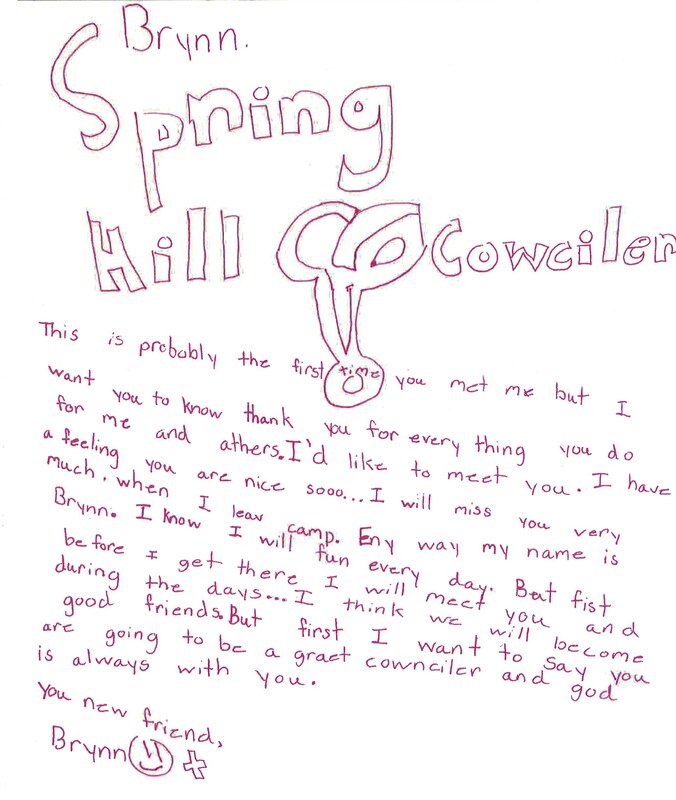 But, as they say, there’s a first time for everything and one of our campers, Brynn, sent such a letter to her future counselor. In it Brynn thanked, in advanced, her future counselor for a great week, for also becoming her good friend and affirming what a great counselor Brynn knows she’ll be. It obvious Brynn’s been to SpringHill before because she knows what to expect – great staff, new influential relationships, memorable experiences and transformational moments. I, as well as the SpringHill team, are both humbled and challenged by Brynn’s confidence in us.